FIR rays penetrate just below the skin and promote a deeper more beneficial cleans through our bodies natural cleansing sweat process. The most immediate and noticeable effect is the tremendous relaxation; it alone can have a profound impact on your health. 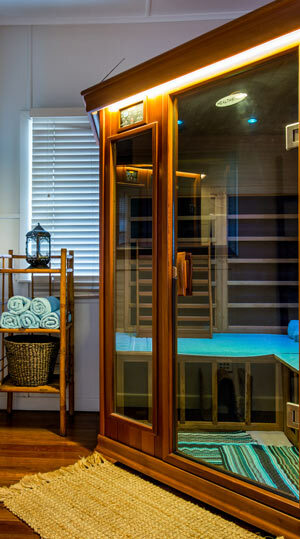 Just 15 – 20 minutes in our sauna may reduce muscular stress, tension and fatigue. It is the deep penetrating ability of FAR INFRARED radiant heat that aids our bodies to naturally relax and tone. Improves skin, tone, texture and colour. Perspiration allows for deep cleansing, eliminating impurities and removal of dead skin cells, leaving the skin feeling soft and glowing. The soft radiant heat created by our saunas has been likened to the comforting warmth felt being behind a glass window on an autumn afternoon, and unlike the stifling heat of conventional saunas, our saunas allow for fresh air to circulate the interior, without compromising the effectiveness of the unit. This natural energy, created by the carbon fibre panels, covers your body with far infrared light, normally gained by exposure to the sun. This form of light has been fundamental to all living things.